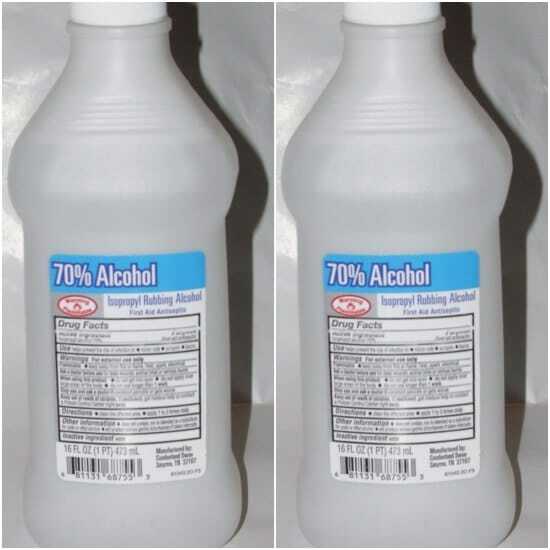 Do you have a bottle of rubbing alcohol in your kitchen or bathroom that is not used a whole lot? There are many uses for rubbing alcohol in the home you that probably don’t know. You will be surprised to know there are many cleaning and health uses for rubbing alcohol. Rubbing alcohol is not only used to sterilize the skin, but can be used to sterilize items like tweezers and thermometers. Simply mix rubbing alcohol with vinegar and put a few drops in your ear. This can also help keep water out of your ears. Itching caused by bug bites and poison ivy can be lessened by dabbing the skin with rubbing alcohol. Mixing aloe vera gel with rubbing alcohol is a great way to make a homemade sanitizer. Add some rubbing alcohol to a spray bottle and add some water to use on greasy counters. Wipe and buff eye glasses with rubbing alcohol is a great way to get them crystal clear. Spray adhesive residue with rubbing alcohol and wait for it to dissolve. This is one of the best uses for rubbing alcohol in the home. Spray a bit of rubbing alcohol on a mirror to remove hairspray residue. Rubbing alcohol is a great dust remover as can clean venetian blinds in a snap. Spraying some rubbing alcohol on your windshield on a frosty morning eliminates the need for scraping.